The stock looks prepared to make up lost ground against competitor MasterCard. Visa (V - Get Report) shares have underperformed those of rival credit-card processor MasterCard (MA - Get Report) by 11% over the last six months. But technical indications now suggest that Visa may be poised to make up lost ground against its competitor. The chart shows shares of MasterCard breaking above a two-month downtrend line in the beginning of the year and then continuing to climb to new all-time highs. Visa rallied over the same period, but fell short of retesting intermediate-term resistance in the $83.25 area. 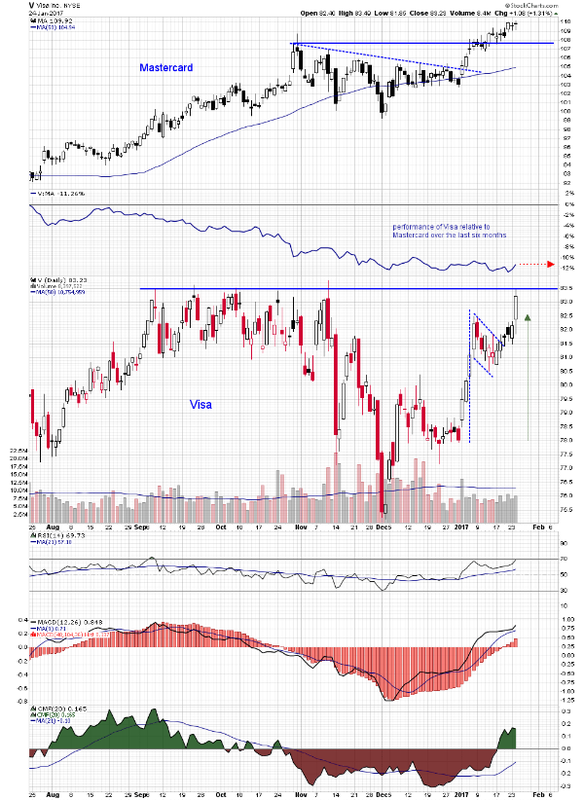 Visa pulled back after the initial bounce and began consolidating in a small declining channel, forming a larger flag pattern, and last week broke above the flag downtrend line. There was strong follow-through price action in Tuesday's session with the stock up 1.3%, compared to MasterCard's gain of 0.26%, and a high which briefly touched the $83.49 level. The relative strength index crossed above its center line at the end of last year and has tracked higher, reflecting continuing positive price momentum. Daily moving average convergence/divergence is overlaid on a weekly histogram of the oscillator. It is above its center line on both time frames, indicating positive short- and intermediate- term trend direction. Chaikin money flow has moved into positive territory, suggesting that the flag breakout is being bought, which should help power a second break above the intermediate-term resistance level. The flag pattern projects a price objective in the $87 area, which is arrived at by taking the height of the flagpole and adding it to the breakout point. A flag pattern is a continuation pattern, which means that if the move occurs, it should be quick and likely overtake the momentum in MasterCard shares. Visa is a long candidate at its current level, using a trailing percentage stop.